Samuel Slater (1768-1835), after an apprenticeship by the Arkwrights and Strutts, built the world's first successful water-powered cotton mill in Pawtucket in 1790, and Pawtucket was home to a thriving textile industry for the next 150 years. Samuel Slater was born at or near Belper in Derbyshire on June 9, 1768, the son of a prosperous yeoman farmer. As a youth, Samuel demonstrated considerable skill as a mechanic, and in school he excelled in arithmetic. The Slater farm was located near the river Derwent. The first spinning mill driven by water power was built in Cromford on the Derwent in 1771 by Jedediah Strutt and Richard Arkwright, the inventor of the water-frame spinner. In 1776 they dissolved their partnership, and Strutt took over his own mill in Belper, where Slater began his apprenticeship at the age of 14. 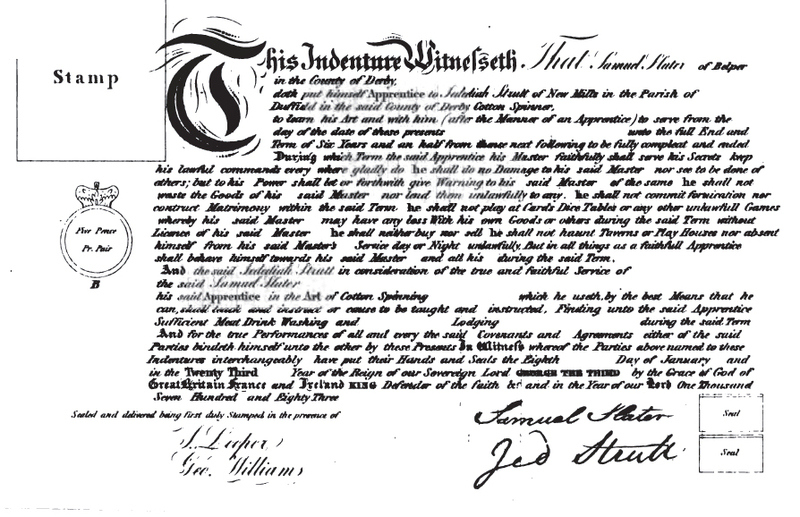 Although the terms of the indenture were harsh and Slater had to work hard, Strutt treated him kindly. Slater learned to operate all the machinery involved in converting raw cotton into yarn. When the machinery broke down - a frequent occurrence since the spinning industry was still in its infancy - he made the necessary repairs. See Slater's Apprentice Papers, signed by Jedidiah Strutt. At the end of his apprenticeship Slater concluded that the best opportunities for advancement in the textile industry were in the United States. Handicraft methods still prevailed there, since no American had yet been successful in constructing a spinning machine, and British law prohibited the export of such machines. In 1789 Slater made his way to London, where he negotiated his passage to America. He told neither his family nor his friends of his plans. WEB LINK Slater The Traitor? Slater soon became a partner in the firm. His principal responsibility was to design and construct duplicate models of the equipment used in British milling establishments. Brown again supplied the capital. With the aid of a local woodworker, an iron manufacturer, and a general helper, Slater constructed the first practical copies of Arkwright's carders, water-frame spinners, and looms in the United States. The new mill went into operation in December 1790. Slater hired children from the town and surrounding area and trained them to operate the machinery. This was a common practice in both the United States and England. The raw cotton was sent out to local women for cleaning before it came to the mill for carding. The mill did not run smoothly at first. There were problems in securing good-quality raw cotton, and often the equipment broke down. More importantly, the shop was unable to produce cotton yarn in sufficient quantities to meet the demand. In 1793 the firm of Almy, Brown, and Slater decided to expand. Picking a site on the Blackstone River, they constructed a new dam to provide the power and built a large mill. They installed three carders and two spinning frames containing 72 spindles. The mill, called the Old Slater Mill, went into operation in July 1793. Dissension within the partnership over management of the mill convinced Slater to build his own mill. Still maintaining his interests in Almy, Brown, and Slater, he organized a new firm, Samuel Slater and Company, in 1798. His mill, completed in 1801, was the first in Massachusetts to use the Arkwright system. 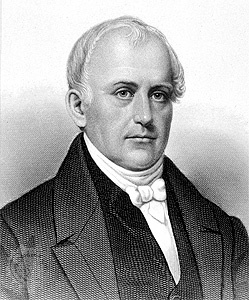 Slater played an active part in establishing other cotton mills in Rhode Island, Connecticut, Massachusetts, and New Hampshire. By 1828 he had been involved in 13 different partnerships concerned with processing cotton. Because of his contributions to the cotton industry in the United States, he is often referred to as the father of American manufacturers. Picture of the Slater Mill, on the Blackstone River, in Pawtucket, Rhode Island. Slater to be Honoured with a Blue Plaque? Samuel Slater is one of 12 historical figures and places which could get a blue plaque dedicated to them. He was nominated by artist Rosemary Timms, of Milford, who says the plaques are "not necessarily for good guys". She says he was revered as a hero in the USA. He had emigrated illegally because it was not permitted for people with nationally important technical knowledge to go abroad. He became known as "Slater the Traitor" in Derbyshire. Mrs Timms said: "He broke the market in America. Before he came, it took seven hand spinners to produce the yarn for a framework knitting machine or a loom. With Arkwright's water frame it was automated and quicker. He also introduced the factory system that had been developed in the Derwent Valley." Mrs Timms, who has made a film and co-authored a book on Slater, says she wants to see the blue plaque put up at his birthplace – which does not match the description he gave to his American fans. Mrs Timms said: "He told people in America he was born at a farmhouse in Blackbrook but our research showed it was at a tiny cottage in Chevin Road, Belper. That's where we want the plaque. I think he had wanted his life to seem more grand." Derbyshire County Council began running its blue plaque scheme in November 2009. The first six historical figures to be recognised were announced last year. Now it is asking the public to vote for another six from a field of 12 nominations. These were selected from public nominations by a panel of experts. Results will be announced in September.